Yesterday I had diner with Parker, and spent a lot of time with him talking about what it is to be a nerd. I find the concept interesting for a couple of reasons, which I’ll address in another overly-long rambling essay. Ready…go! Has the definition of nerd really grown up with me, or has nerdy ALWAYS been perceived as a cultural identity by nerdy adults? Is it only children and teens who feel ashamed to be called a nerd? If so, why do so many of us WITHIN the culture still harbor vestigial insecurity surrounding our culture. I’m confident in my profession. I’m very happy to have the interests that I do. And yet, there’s part of me that still wishes to prove that I’m not a nerd in the pejorative sense. This manifests most often by pointing fingers at other people and saying “Well, at least I don’t do THAT. 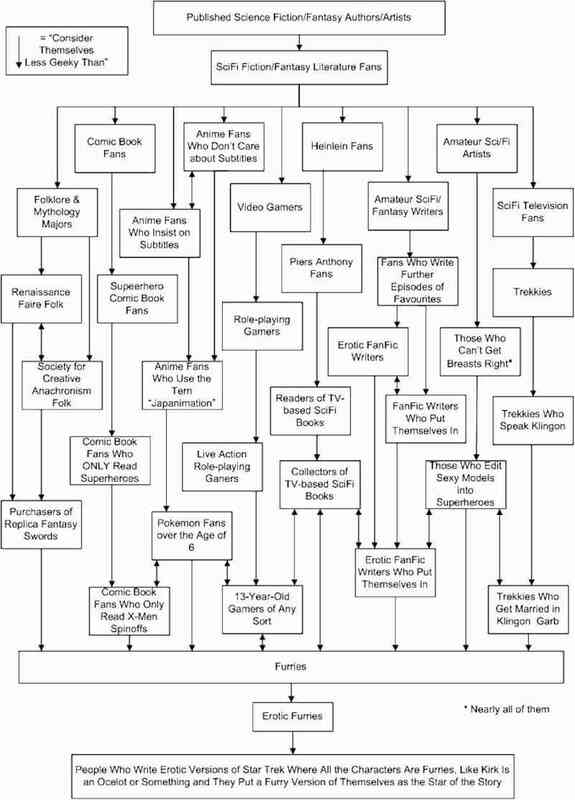 Those are the real nerds.” (See the Geek Hierarchy for a look at this in depth.) Why do we do things like this? Why do sf/f writers point at people who dress up like Klingons and say “Whew, glad I’m not one of those guys?” Why do role players point fingers at LARPers and say, “Look at those losers!” Do we have any right? United we stand, divided we fall. Every time we within nerd culture make fun of someone else’s hobby or passion, all we’re really trying to do is mainstream ourselves in a futile attempt to get a little bit closer to that ‘coolness’ that most of us never knew in high school. I think we should just give it up. It’s all in our heads. We, as fantasy and science fiction authors should understand that concept.